Ok, you’ve been working on getting in the miles and building your base for the VT 100 with 21 weeks to go. What else could you be doing? How about some strength work!! Distance runners need to acquire a sizeable level of general strength in both the legs and the upper body to be successful. Just running doesn’t work all the muscles needed to get this strength and can cause an imbalance. With the proper strength program, workloads of greater intensity can be managed more easily. Greater muscular strength decreases the risk of joint injury or overuse injuries by minimizing connective tissue stress (bone, ligament, tendon, or cartilage) thus maintaining joint integrity. A progressive resistance exercise program helps strengthen these connective tissues, making the entire support system more durable. Some recent studies have shown that as few as six weeks of proper strength training can significantly reduce or completely relieve many common injuries. It also reduces the recurrence of many other common injuries. By strengthening muscle, as well as bone and connective tissue, strength training not only helps to prevent injury but also helps to reduce the severity of injury when it does occur. In addition to injury prevention, strength training improves performance. Studies show that with as little as ten weeks of strength training, 10K times decrease by an average of a little over one minute. The research has also shown that running economy defined as the steady-state oxygen consumption for a standardized running speed, will be improved due to strength training. By improving running economy, a runner should be able to run faster over the same distance due to a decrease in oxygen consumption. Improved running economy would also increase a runner’s time to exhaustion. Strength training for the runner can be divided into three time periods: pre-season, in-season and post-season. During these blocks of time, the volume and number of sets performed changes to keep pace with the different seasonal demands that running presents. The greatest benefits of strength training for runners should be gained during the pre-season. This is the time to maximize your strength for the upcoming race or higher-mileage season. Volume (sets times repetitions) should be the highest during this time of year, which complements the lower running mileage. When trying to increase strength maximally, doing three sets per exercise (with about a two minute rest between sets), and five to six repetitions per set has been shown to be most effective for athletes. Determining the amount of weight or resistance to use is somewhat a trial and error process. The last repetition should feel as if you couldn’t do another. If your last repetition seems easy, add five to ten percent more weight or resistance. Total body training two to three times a week during the pre-season will suffice, giving adequate time for full recovery after workout. The in-season for most runners comprises the greatest portion of the year. It could last from mid-April to mid-October. The goal of the in-season strength program is to maintain as much strength as possible. In-season training mainly requires one to two strength training sessions per week with only one to two sets of eight to ten repetitions per exercise. The final third of the training calendar is referred to as the post-season. For most runners the post-season is from mid-October to mid-January. For competitive runners, post-season starts when your racing season is over. The first four weeks of the post-season are a time to recover. During this time, strength training can be performed two times a week consisting of only one set of eight to 12 repetitions of each exercise with adequate rest periods between sets. After four weeks of recovery, increase your strength training volume to two to three sets of each exercise with 60 to 90 second rest intervals. So, how do you go about designing the most effective progressive-resistance exercise program to improve running performance? What type of equipment should be used: free weights, machines or resistance bands? Any of the above, just do it. No single method has been shown to be superior. But the key to success is to train regularly. Give each body part attention about two to three times a week, maybe 20-30 minutes per session total. Train the muscle groups most in need of conditioning that will be of greatest benefit to running. Place greater than normal demands on the exercising musculature for desired increases in strength to occur. Work the muscles throughout their full range of movement so that strength gains occur in the full range of motion. About Jack – I coach marathon and ultra trail runners with The Run Formula. My first ultra was the VT50 in 2004. The next year I ran my first 100 miler at the VT100 where I finished in 6th. 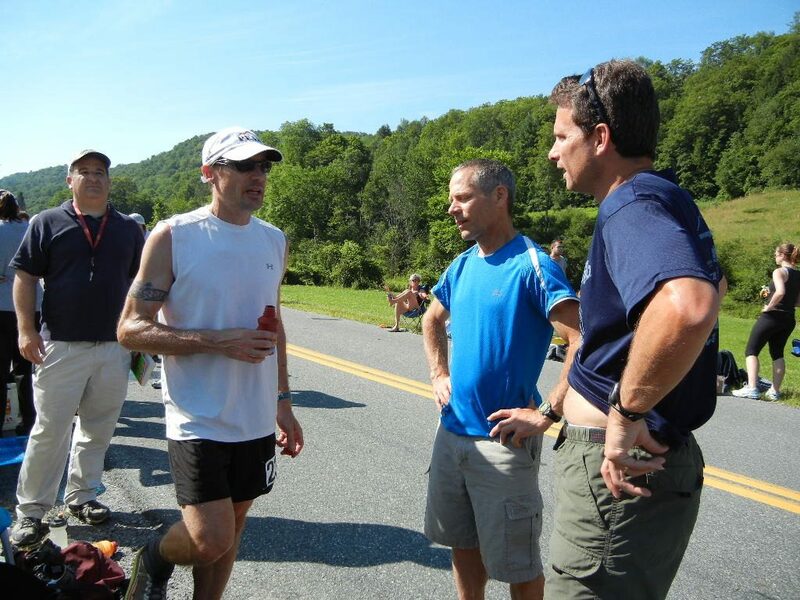 I continued to run the VT 100 for the next four years coming in third 3 times and then in 2009 was the overall winner. Since then I have traveled all over the country and in Europe running some of the most difficult and most scenic ultra distance races. Run coach bio here.